All our recipes require fresh ingredients from local farmers. 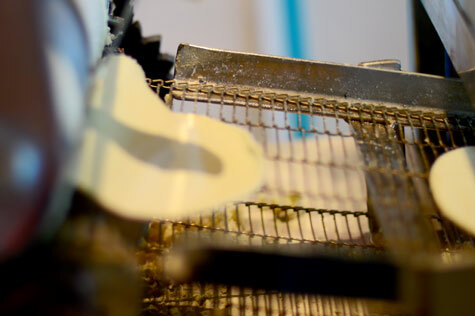 All our tortillas are crafted to perfection and made daily on location. When eating here, you can be certain you are eating the best. We give full attention to every dish we prepare. We only use the freshest ingredients for our dishes and offer breakfast, lunch, dinner, tortillas freshly made at our restaurant and fresh hand squeezed juices as they are orderd. Choice of meat topped with onions, cilantro, & salsa. Excludes fish or shrimp. 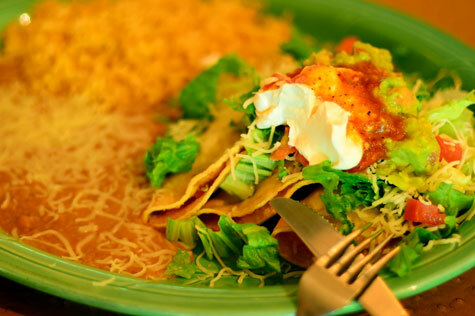 Choice of meat topped with lettuce, tomato, cheese, sour cream, guacamole, and salsa. Excludes fish or shrimp. Topped with lettuce, tomato, sour cream, guacamole, salsa, and cheese. Choice of meat, rice, whole or refried beans & salsa. Choice of meat, regular super burrito filling, sour cream, cheese, and avocado. Choice of meat, super burrito filling, smothered in green a la diabla enchilada sauce. Deep friend burrito with choice of meat, rice, beans, topped with lettuce, tomato, cheese, sour cream, and guacamole. Choice of meat plus fish or shrimp, and supper burrito filling. Steak or chicken, grilled peppers & oinions, and super burrito filling. Shrimp or fish sauteed with tomatoes, onions, cilantro, lettuce, and super burrito filling. pork in a green tomatillo sauce, and super burrito filling. prawns in a hot and spicy chipotle sauce, and super burrito filling. 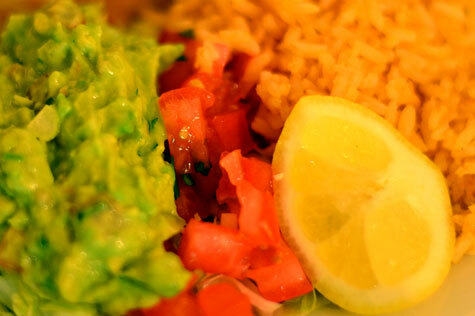 Rice, beans, lettuce, tomato, avocado, sour cream, cheese & salsa. Choice of meat topped with onions, cilantro, & salsa. Choice of meat topped with onions, cilantro, salsa and served with rice and beans. Jumbo shrimp in tomato sauce with chopped onions, cilantro & avocado. With octopus (con pulpo) add $1.50. Hot and spicy seafood soup with fish, shrimp, and octopus. 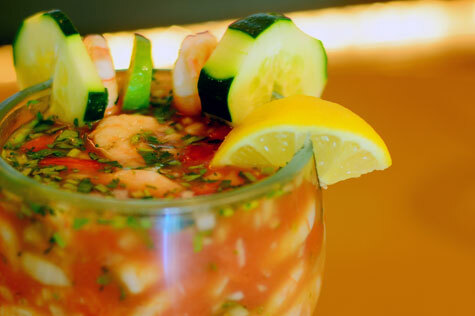 Fully cooked shrimp mixed with chopped onions, tomato, and cilantro. Shrimp in ranchera sauce served with rice, whole or refried beans and corn or flour tortillas. Grilled prawns with house made seasoning, served with rice, whole or refried beans and corn or flour tortillas. Prawns in hot and spicy chipotle sauce served with rice, whole or refried beans and corn or flour tortillas. Garlic flavored prawns served with rice, whole or refried beans and corn or flour tortillas. 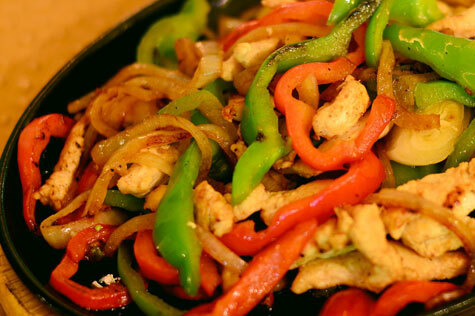 Shrimp fajitas served with rice, whole or refried beans and corn or flour tortillas. Prawns in a spicy chile de arbol salsa. All salads served over romaine lettuce, tomato, cucumber, avocado, cheese, and choice of ranch, thouseand island, italian, or balsamic vinegar. Green salad mix with tomato, cucumber, avocado & cheese. Scrambled eggs & ham, served with whole or refried beans & corn or flour tortillas. Mexican-style saussage with egg, served with whole or refried beans & corn or flour tortillas. Eggs overeasy topped with ranchera sauce, served with whole or refried beans & corn or flour tortillas. Choice of meat mixed with scrambled eggs, served with whole or refried beans & corn or flour tortillas. Fried tortilla chips mixed with eggs, salsa & cheese, served with whole or refried beans & corn or flour tortillas. Scrambled eggs with onions, jalapeno peppers & tomatoes, salsa, cheese, served with whole or refried beans & corn or flour tortillas. Filled with your choice of any of the above breakfast plates. Served with fresh house made tortillas. Only served Saturday and Sunday. All dishes serverd with rice and beans. Choice of meat topped with onions, cilantro, and salsa. Excludes fish or shrimp. Topped with cabbage, tomato, sour cream, cheese and salsa. Melted cheeese in a flour tortilla with choice of meat and or cheese. Green pepers filled with cheese. Pork in green chile sauce. Filled with shredded pork in red sauce. Choice of meat or cheese topped with green or red sauce, cheese, and sour cream. Crispy rolled taquitos filled with chicken. Choice of meat topped with lettuce, tomato, sour cream, cheeese, guacamole, and salsa. Carne asada and camarones a la plancha (grilled prawns), and guacamole. Grilled chicken breast with a hint of lemon flavor served with rice, beans & corn or flour tortillas. Thinly sliced beef steak grilled and topped with sauteed onions. Grilled strips of steak with onions, bell peppers in a spicey ranchera sauce. Steak, bacon, sauteed ham, melted cheese, bell peppers, onions, topped with cheese. Chicken or steak grilled with onions, and bell peppers. Shrimp grilled with onions and bell peppers. Chicken and steak grilled with onions & bell peppers served with rice, beans & corn or flour tortillas. Chicken, steak, shrimp grilled with onions & bell peppers served with rice, beans & corn or flour tortillas. Choose from enchilada, tamal, crispy taco, and chile relleno. Served with rice & whole or refried beans. Corona Extra, Corona Light, Tecate, Negra Modelo, Modelo Especial, Dos X Amber, Dos X Lager, Pacifico, estrella, victoria. Budwiser, Bud Light, Miller, Coors Light, Miller Genuine Draft. White Zinfandel, Chardonnay, Cabernet Sauvignon. Cork fee is $8. Choice of orange, pineapple, carrot, beet, celery, apple, spinach, papaya, melon & grapefruit. Chuy grew up on his father's ranch in Jesus Maria, Jalisco, Mexico. In 1985 Chuy came to California to make a humble living as a farm worker in the small town of Winters, CA. 18 years later, in August of 2003, he opened up Chuy's Taqueria in Winters and it was an instant success. 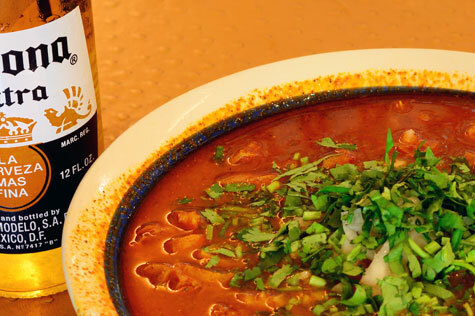 Over the past ten years, Chuy's Taqueria has become a staple in downtown Winters restaurant scene. Through the success, Chuy's Taqueria has been able to undergo growth and expansion in downtown winters and into Natomas, CA. The Natomas location was opened in February 2014 by Chuy's son, Alex, who saw the success that quality food and service can be and wanted to follow in the footsteps of his father. 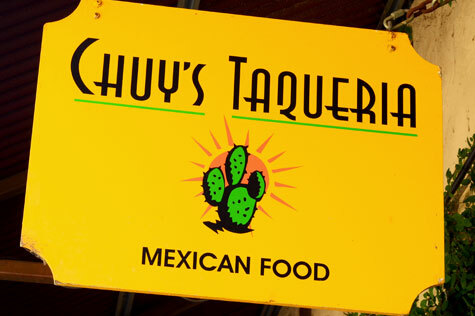 Today, Chuys Taqueria continues to inspire it's community with delicious and authentic cuisine.